Shopping is a fairly routine experience in our house and I mostly purchase the same products at the supermarket, however, every now and then I give in to an impulse buy. On a recent trip to Aldi (a discount Chain) I came across this box of extracts that included natural maple which was added to the trolley. Maple flavour is something that I really enjoy, mostly in the form of maple syrup, which is not always a good choice for baking and icings. I first tried it out by adapting the Brownie recipe to Maple and Pecan Brownies and then again in a batch of these biscuits. They had a subtle maple syrup flavour that was complimentary to the pecan nuts, the sugar added a nice crunch to the topping. Use a saucepan that will hold all the ingredients. Melt butter in a saucepan and cook until the butter/milk solids turn a light golden brown. The butter will foam up and then settle. Take care as it can burn easily. Add sugar, stir well and allow the mixture to cool. Add maple extract and egg, mix well. Stir in flour and chopped pecans. Mix well to make firm dough. Dip each ball into the coffee sugar, flattening slightly and then place on a tray lined with baking paper. 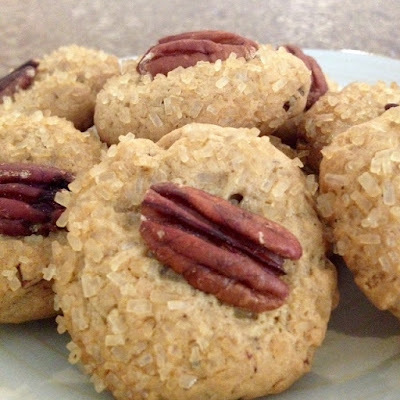 Press a pecan nut into the centre of each biscuit. Bake at 170 deg C until light golden brown. Cool cookies on cake cooler. This the product that I used. There are other maple flavourings available including oil based extracts that can be used in chocolate. This is an alcohol based product and needed at least a tablespoon of the extract to get the maple flavour. Different brands most likely vary in intensity so add a little at atime and taste the dough as you go.